Do You Remember This HUGE Viral Hit Video? See The Kids All Grown Up! The boys from the popular video “Charlie bit my finger” are now all grown up. They became internet starts and their video reached over 800 million views and counting. Are you curious what are their thoughts about their video becoming popular now that they are already grown up? According to Harry, it makes him laugh and they think it’s odd that that those people have watched it. Their YouTube views is overwhelming and I’m sure they also felt the same. 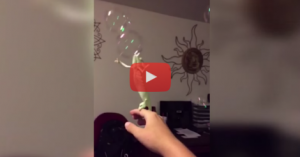 It’s Confirmed: Everything On Planet Earth Loves Bubbles.